Successfully Added HK Warehouse Blackview A9 Pro Android Phone - 4G, Android 7.0, Dual Rear Camera, Quad Core CPU, 2GB RAM, 5 Inch Display (Black) to your Shopping Cart. Smartphone makers Blackview have made a name by launching phones with good technical specs at exceptionally cheap prices. With the Blackview A9 Pro they once again surprise us by offering a scintillating phone at a very affordable price. With a 5 inch HD screen, the Blackview A9 Pro smartphone is big enough to offer a great visual experience without being awkward to carry or slip in your pocket. the 720p display has a pixel density of 294ppi and offers accurate color reproduction, nice contrasts, and a bright image. This ensures movies and games can be enjoyed to the max. The Blackview A9 Pro is armed with a quad-core MediaTek SoC clocked at 1.3Ghz and 2GB of RAM which promises swift multitasking capabilities and enough processing power for games as well. equipped with 16GB of onboard storage. Add to this a micro SD card slot with the ability to add an additional 32GB of storage and even users with the most voracious appetite for games and movies should have plenty of storage space. The icing on the cake comes in the form of an Android 7.0 Nougat OS. This is the latest version available and comes with some advanced features that will wow users. An impressive dual rear camera with 8MP and 0.3MP Samsung sensors ensure you'll be getting a high-end photography experience that will render clear images in vivid detail for every magical moment. Compatible with 4G networks the A9 Android phone offers high-speed browsing, streaming and downloading. A large 3000mAh battery lets you enjoy 5 hours of talk time so you'll have enough juice to see you through the day on a single charge. 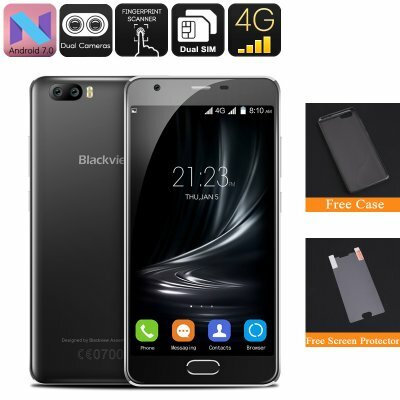 The Blackview A9 Pro Android phone comes with 12 months warranty, brought to you by the leader in electronic devices as well as wholesale smartphones and mobile phone accessories..